Ireland awoke to the beginning of the Great Hunger in 1845. Experience the heartbreaking stories of the Irish during the five long years of the Potato Famine. It was a time of great injustice when over one million Irish died. But it was also a terrible blessing for over one million Irish who fled to America and survived. Terence O’Leary, an Irish-American author, was born in Chicago, Illinois, but has spent his teenage and adult life in Northwest Ohio. A Christmastime dinner conversation about his ancestors led author Mr. O’Leary on a four-year journey to write historical novels Irish Crossings: Caitlin & Paddy’s Story and Irish Crossings: Danny’s Story. Mr. O’Leary’s five critically acclaimed, realistic coming-of-age novels focus on teenagers facing a family crisis. 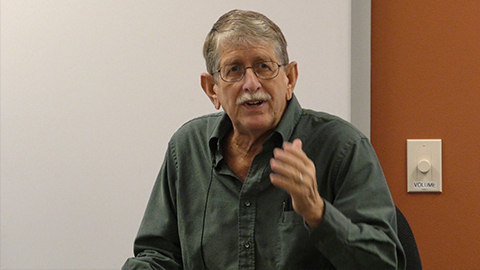 His presentation was part of Lourdes University Lifelong Learning. Lifelong Learning is open to all interested men and women, the only requirement for participation is an interest in ongoing learning.